Horses sleep standing up and laying down. When a horse sleeps, he lays down in a comfortable, safe spot and goes into a deep slumber cycle called rapid eye movement (REM). However, a horse can also take several, short naps throughout the day in a standing position. This is a much lighter sleep made possible because of a horse's stay apparatus in his legs. Lying down is more emotionally and physically stressful for a horse than standing. The horse's own weight can cause stress. According to Dr. Joe Bertone, all horses will only lie down when they feel safe. "Some horses feel fine no matter where they are and others are timid and require a sentinel horse around to guard from threatening activity." Many prefer lying down in a dry, sheltered area that is quiet. It is only with these things in order that a horse can experience slow-wave, REM sleep as he stretches out on his side or lies on his sternum. A slumbering horse is easy to recognize. His head and neck droop, eyes close and ears relax. According to Dr. Bertone, the amount of time a horse sleeps standing up during the day varies according to breed and personal needs. When standing, the horse carries its weight on both forelegs and one hind leg. The other hind leg simply relaxes with the hoof up on its toe. This is because of the stay apparatus, which allows a horse to stand and exert little energy while staying relaxed in this locked position. A standing horse never gets the full extent of sleep that a horse lying down does. Sleep deprivation happens when a horse desperately needs paradoxical sleep. 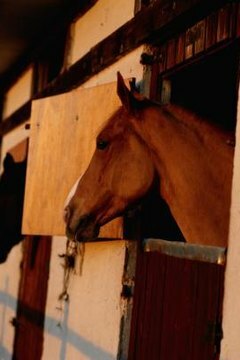 Sometimes lyme disease or pain, such as musculoskeletal or abdominal pain, prohibits a horse from getting the sleep he needs. Other times, the horse may be experiencing aggression issues or anxiety, or lacks an alpha mare nearby who can give the horse the confidence to lay down. According to Dr. Bertone, physical signs of sleep deprivation include weight loss and marks or scars on a horse's fetlock from collapsing and catching himself. Also, a crabby horse could be a sign of environmental issues, he explains. "Sometimes simply giving a horse a larger stall or bringing him inside can automatically fix sleep issues." Do Horses Close Their Eyes When They Sleep?